Before the days of the internet, Nintendo Power was the source for all news and secrets about Nintendo. While all those pages held invaluable information for the time, they also played home to some entertaining comic strips, such as Howard & Nester and Super Mario Adventures. 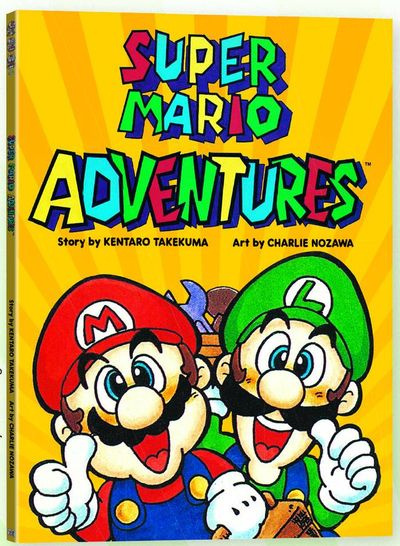 Naturally, it's relatively difficult for fans of the comics to get ahold of a complete collection of all the issues of Nintendo Power (barring certain internet archives) so a company has decided to do a reprint of Super Mario Adventures. Viz Communications will be handling the publishing of the graphic novel, and it's expected to launch on 12th October of this year. For about ten bucks, all comics from the original 1992-1993 run will be carefully reproduced here in full color. If nothing else, it'd sure make for a great "coffee table book" and it's an interesting piece of Nintendo history. For more information, you can read up about it here. What do you think? Do you remember this from it's original run? Would you buy reprints of other Nintendo Power comics? Share your thoughts in the comments below. This looks pretty cool, I think I might have to pick it up. I've wanted to read these comics for a long time as I thought they looked quite fun. I think the Super Metroid and Star Fox comics getting reprinted would be awesome as well! I love these comics! Glad to see them being reprinted! For anyone who is considering getting this, I highly recommend it! The plot is quite funny, and it's an overall great read, in my opinion. Are these the ones where Mario was a jerk to Wario as a kid? the Link to the Past comic was recently reprinted as well, and it remains the surreal classic it always was. these translated Nintendo comics are universally great. @bngrybt I don't know, but I do know they're the ones where Peach goes berserk and breaks out of Bowser's castle. you don't understand. you don't understand. when I was a little tyke in pigtails, Nintendo Power was cool as it was. but when they printed Nintendo comics in the back, it was the dopest ish in the world. they were delightfully surreal, gleefully funny, and wonderfully drawn. the Link to the Past reprint from Viz was fantastic. but the Mario comic was something very special. this will be well worth buying for any Nintendo fan. This must have been an American thing. I never heard of this as a kid. Actually, that was Wendy's tower. I remember reading Super Mario Adventures a decade ago on YoshiArt.com. Good times! Oh, cool. I always wanted it read these comics. Might get this someday. Awesome, I wanted to read this again. But the original '90s print was over a hundred dollars last I checked. I still have the original version somewhere. It's pretty ragged at this point, though, having gone through my childhood. Will absolutely pick this up, and I recommend it. It's good stuff. @Shugo - please remember this is a 'no profanity' site. Thanks. Yes! I remember reading this manga in the Swedish version of Nintendo Power! Not bad!! I got the Zelda manga and this Mario collection of books will just add to that! The more Nintendo comics and manga Viz can bring us, the merrier. This really would go great with the NES Classic as a retro gift for Christmas. Awesome news! Just a few days ago I saw the Nostalgia Critic's review of this comic and that peaked my interest, but when I went on ebay and saw that it fetched a $100+ price tag, I was sooo disappointed. Can't wait to pick this up! I read this comic not too long ago. It was actually pretty funny, and the art is quite good. This is cool. I have the original version but it's pretty beat up that I don't really touch it much for fear of it falling apart more. I might pick this up as the comic is a great read. Oh, nice! I remember reading about this comic on Nintendolife a little while back, and I've been wanting to read this. Edit: Pre-ordered! ^.^ Glad it's so cheap. Nice! I always wanted to give this a read, so this is great! I HAVE THIS BOOK!!! I love it! It was the first time you see Luigi dress as the Princess. It was REALLY hilarious, too! Ooh, neat. I'll have to see if my local comic shop is carrying it when it comes out. This is really cool. Keep it alive! Yup, although that part was only a small segment at the end of the comic. I wish Nintendo released cool stuff like that stuff. I'm gonna buy it. I bought the Zelda comic (A Link to the past). When I started getting into video games one of my friends let me borrow his Nintendo Power magazines. He had them all the way to the beginning! I remember reading some of the Mario comics. In one of them Bowser was trying to get Peach to marry him but she wasn't having any of that! She was so assertive and fighting him every step of the way (until she got hypnotized). That was the Peach I grew up believing in! I'm so happy they are coming back!! I loved the Star Fox comic, but I doubt Nintendo cares too much about it to have it reprinted. I have the old printing of the Super Mario Adventures TPB I picked up at a yard sale almost 10 years ago. It's fantastic. I'd be a fool NOT to pick this up! I downloaded scans of the first seven issues back around 2004-2005 or so. Definitely down for this! And yes, Luigi wears Peach's dress! @ggnorekthx I would be interested in picking up some more. However i don't want them for storage and display. I would enjoy reading them so they don't have to be in perfect condition, as long as they haven't been drawn in. Which is the case with a lot of these books now.